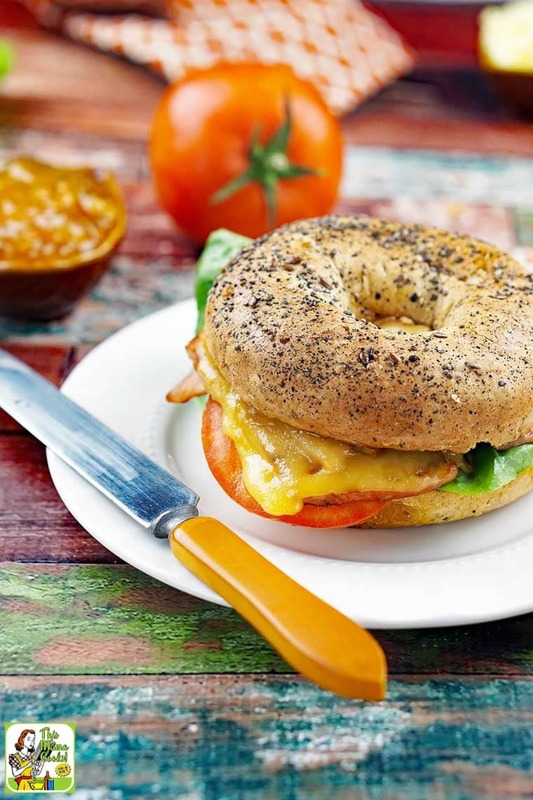 This Ultimate Bagel Sandwich is guaranteed to break you out of your lunchtime rut. Most of us are tired of having the same old lunchtime sandwich routine. That's why you should take the time to treat yourself to this knockout of a bagel sandwich. What makes the Ultimate Bagel Sandwich so special? It’s the ingredients – top-notch bagel bread, a nice deli cheese slice, freshly sliced tomato with lettuce, buttery spread, fruit jam, and Hillshire Farm® Premium Carved Slow Roasted Seasoned Ham. During these cold winter months, there’s also nothing like biting into a warm, toasty Ultimate Bagel Sandwich with a sweet schmear of fruit spread. (I chose an all fruit orange marmalade). Mmmmmmmmmm, so good! If a bagel breakfast sandwich is more your thing, there are directions below on how to add an egg to the Ultimate Bagel Sandwich. Believe me, you'll never go back to having a regular sandwich for lunch again! I’m a big Hillshire Farm customer from way back, and I love their new premium carved, high-quality meats. 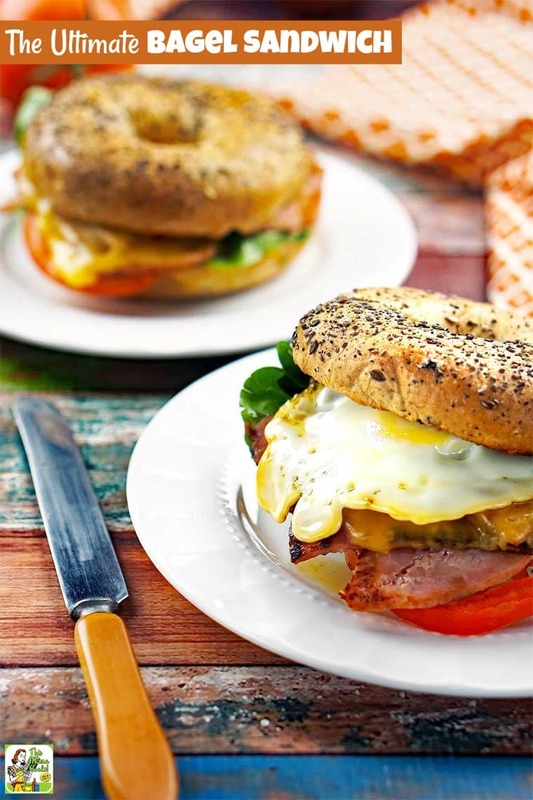 It’s so delicious in this bagel sandwich recipe. And because the meat is all natural and contains no nitrates or artificial preservatives, I can feel good about eating it. I also like the quality. 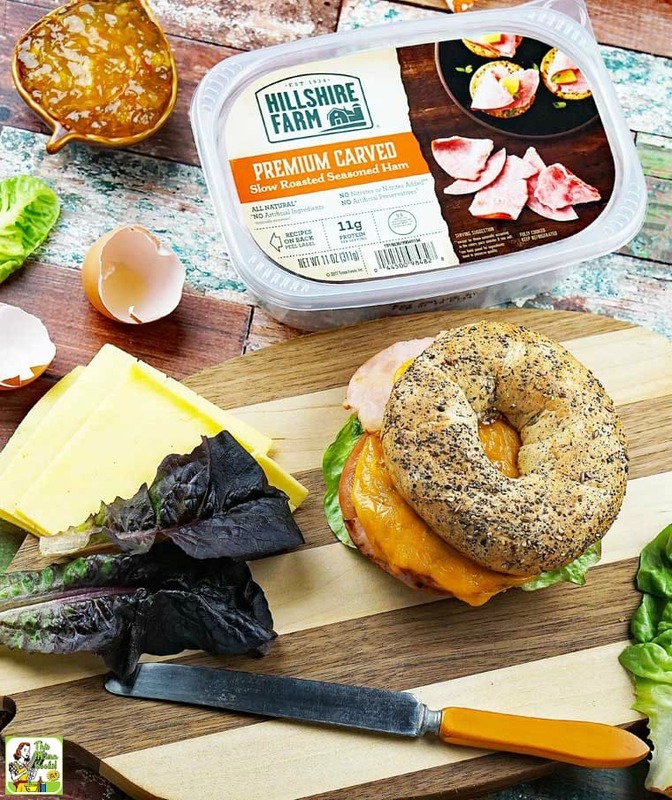 Hillshire Farm Premium Carved Meats are like buying freshly sliced ham, turkey, or chicken breast from the deli counter, but at a more affordable price. This makes it possible to build a better meal with premium meat without busting your food budget! Best of all, you don’t have to wait in line at the deli counter since Hillshire Farm Premium Carved Meats are available with the packaged lunch meat in the perimeter coolers at Walmart. Super convenient! You can also buy Hillshire Farm Premium Carved Slow Roasted Seasoned Ham via Walmart’s Online Grocery Pickup service. I haven’t tried the service yet since I love to browse the aisles for recipe ideas (and a little exercise). But many of my friends LOVE the pickup service, so I'll have to try it soon. While I’ve used the carved meats in my bagel sandwich recipe, I also enjoy using them in chopped salads or as a snack with fruit and cheese. You can also cut up the Hillshire Farm Premium Carved Meats to use in mac ‘n’ cheese, stir fries, and casseroles. So versatile - and tasty! Are you more of a breakfast bagel person? 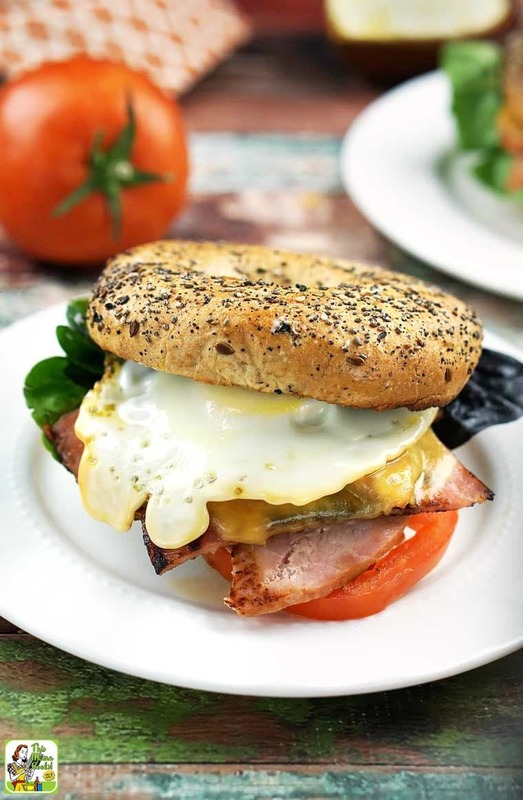 Then add an egg to the Ultimate Bagel Sandwich! There’s no need to wait until breakfast! You can turn this into a bagel and egg sandwich for lunch or dinner! Over medium heat, cook one egg in a frying pan big enough to fry your egg and brown the Hillshire Farm Premium Carved Slow Roasted Seasoned Ham at the same time. That way you can save time by cooking everything at once and you’ll only have one pan to wash. When the egg is almost done cooking (you can cook it all the way through or runny – up to you), turn off the heat and cover the ham with a cheese slice. Then cover the pan with a lid. Let the residual heat melt the cheese. Then follow the rest of the directions as written below. Toast bagel to your liking. In a frying pan over medium-low heat, warm up several slices of ham until they begin to brown. Turn off the heat but leave the pan on the burner. Place a cheese slice on top of the ham. Cover with a lid to let the residual heat melt the cheese. Lightly spread one bagel half with butter or buttery spread. Then lightly spread the other bagel half with fruit jam. 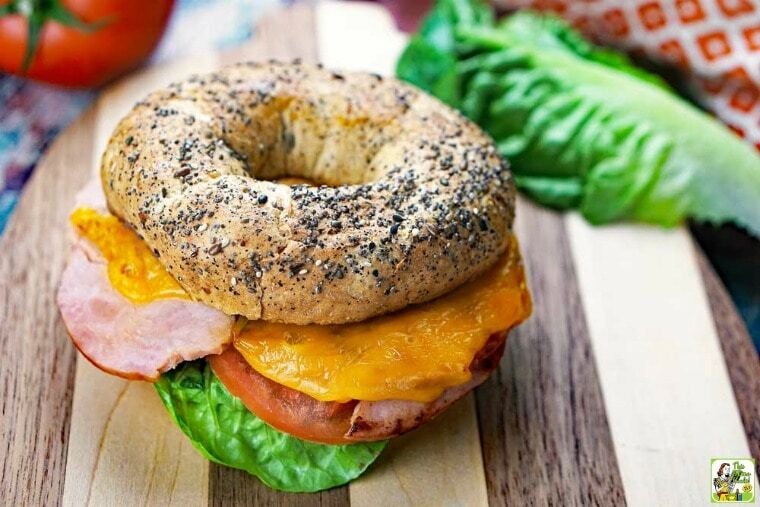 Layer on a couple slices of tomato and a few lettuce leaves to the bottom half of the bagel. Then place ham and cheese on top. Finally, place on the top half of the toasted bagel.